Artist Natalie Frank was interviewed by Mellon Collections Curator Rebecca McNamara about Study for It’s the Gate Where They’re Turning, Turning V, 2006, on January 29, 2018. This interview was supported by Accelerate: Access and Inclusion at the Tang Teaching Museum, a project of The Andrew W. Mellon Foundation. Natalie Frank (b. 1980, Austin, Texas) is a Brooklyn-based artist whose paintings and drawings revolve around women’s bodies, desires, and narratives, drawn from both the everyday and perverse fantasy. 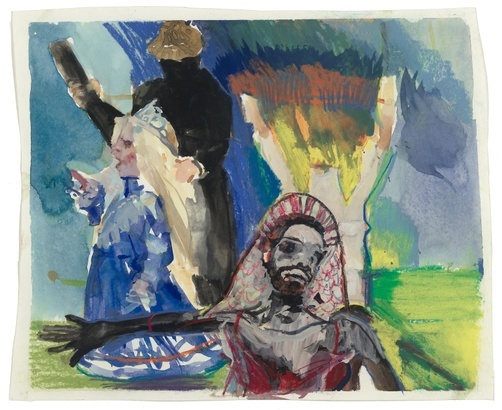 Upcoming exhibitions include drawings based on Anne Desclos’s Story of O at Half Gallery; Dread and Delight: Fairy Tales in an Anxious World at the Weatherspoon Museum; and a collaboration with the Austin Ballet designing sets and costumes for a new, full-length production based on the unsanitized Brothers Grimm’s tales. Publications include Tales of the Brothers Grimm: Drawings by Natalie Frank (Damiani) and The Sorcerer’s Apprentice (Princeton University Press). Her work has been exhibited nationally and internationally, with solo and group exhibitions at Rhona Hoffman Gallery, Chicago; ACME, Los Angeles; Blanton Museum at University of Texas, Austin; and The Drawing Center, New York; Bowdoin College Museum of Art, Brunswick, Maine; Montclair Museum of Art, Montclair, New Jersey; Rose Art Museum, Massachusetts; and London Museum of Design, UK. She graduated with a BA from Yale University in 2002 and an MFA from Columbia University in 2006. Frank, Natalie. “Natalie Frank on Study for Study for It’s the Gate Where They’re Turning, Turning V, 2006.” Tang Teaching Museum collections website. [https://tang.skidmore.edu/collection/explore/48-natalie-frank].